Moist, moreish lime and coconut cupcakes with tangy lime curd centers! Yes please! Feel free to use lemons instead, if limes are out of season. Making your own lime curd is easy-peasy and ensures a delicious, tart flavour. To start, preheat the oven to 180°C (160°C fan) and line a 12 standard size muffin tin with cupcake cases (biodegradable is best). Place the desiccated coconut in a small bowl and add the cold water. Mix to combine. 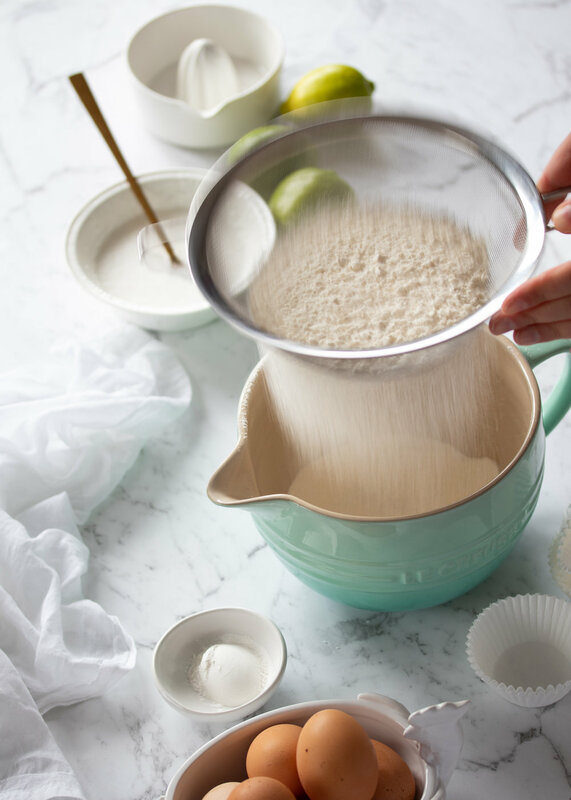 In a medium sized mixing bowl, sieve together the flour, baking powder and salt and set aside. Separate the eggs placing the egg yolks in a large mixing bowl and the egg whites in another large, clean mixing bowl (I place my whites in a free standing mixer bowl). Add the lime zest and caster sugar to the egg yolks and using an electric mixer, beat together until pale in colour. Add the coconut and water mixture followed by the canola oil and combine using a hand whisk. Add the dry ingredients to this mixture and whisk by hand until the mixture is uniform. Whisk the egg whites on a high speed until stiff peaks. 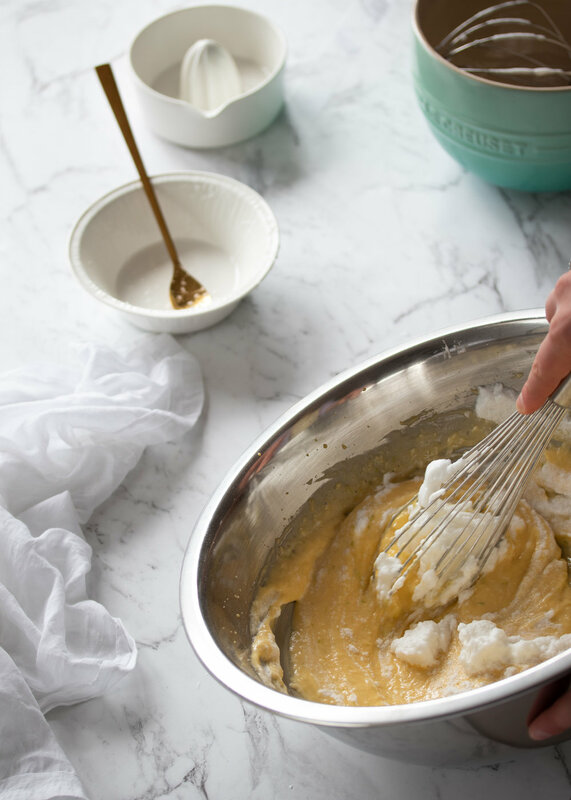 Using a hand whisk, fold about a third of the beaten egg whites into the batter mixture. Fold in the remaining egg whites using a large metal spoon or spatula until uniform. Fill the cupcake cases until just over half way full (I use a cookie scoop for this). Bake the cupcakes until golden and a skewer inserted in the middle comes out clean. To make the lime curd, combine the eggs, sugar and lime juice in a heat proof mixing bowl (stainless steel works best) then place it over a medium saucepan of simmering water (making sure the surface of the water does not touch the bowl). Whisk by hand for approximately 5 - 10 minutes until the mixture thickens substantially. Add the butter and whisk until smooth. Place a sieve over a heat proof bowl or storage jar and pour the thick, cooked lime curd through the sieve to ensure it is smooth. 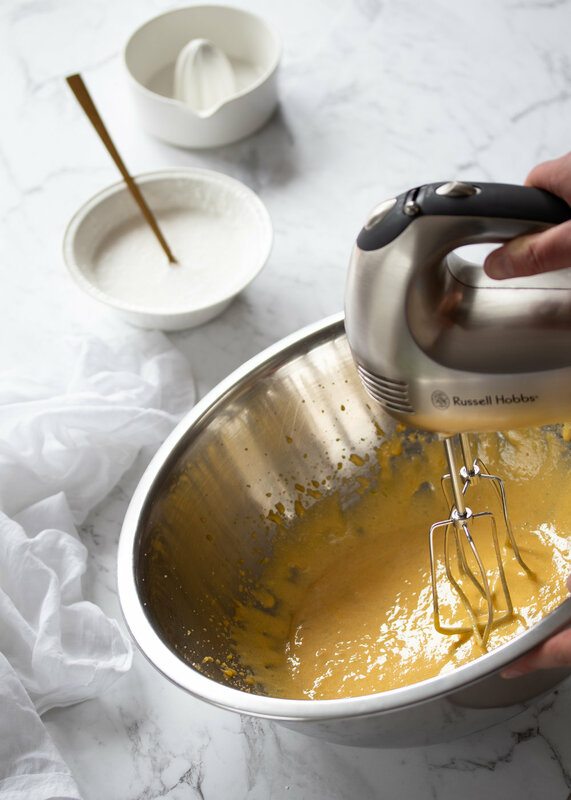 To make the lime mousse icing, beat the cream cheese until smooth (using electric beaters or a free standing mixer - use the paddle attachment). Melt the white chocolate in a heat proof bowl in the microwave (short burst of about 10 seconds at a time mixing with a spoon in-between). Once the chocolate is completely smooth, add the melted white chocolate to the beaten cream cheese and beat together until pale and fluffy (about 3 - 5 minutes, scraping down the sides of the bowl regularly using a spatula). 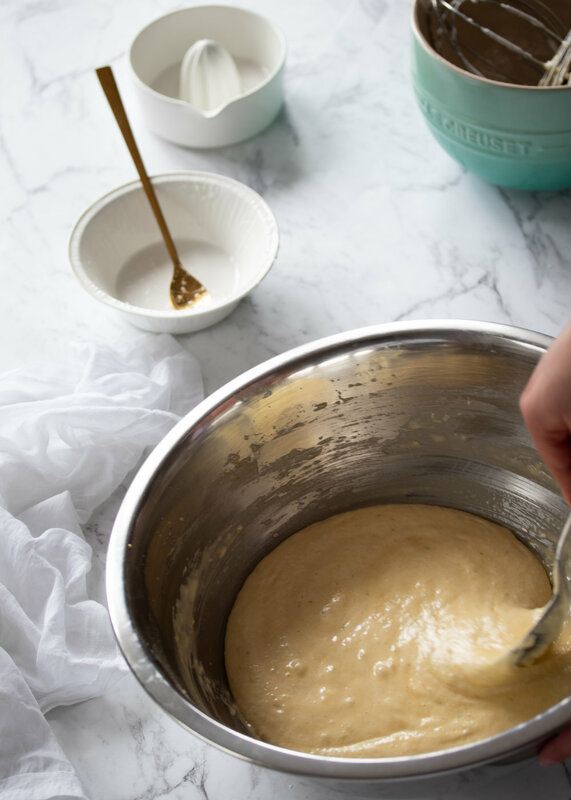 Once the mixture is really pale and fluffy, add half of the cooled lime curd and the zest of a lime (optional) and fold through using a spatula until uniform (the mixture will firm up a bit while you prep the cupcakes). Using a small melon baller (or a round piping tip or knife), make a small hole for the lime curd. Place a small amount of the remaining cooled lime curd in the center of each cupcake. Pipe the lime mousse icing op top (I have used a Wilton 2D piping tip for a frilly effect). Decorate with coconut chips, extra lime zest and fresh mint. Enjoy!